For use in Canada, click here. OMNIgene®•SPUTUM is a non-toxic and highly stable reagent that liquefies and decontaminates sputum samples at the point-of-collection or in the lab while preserving MTb viability for at least 8 days at ambient temperatures. Optimized samples are compatible with all routine TB tests, enable cost-effective sample transport and simplify laboratory workflows while eliminating the need for NaOH/NALC. How can I use OMNIgene•SPUTUM? What tests are compatible with OMNIgene•SPUTUM? OMNIgene•SPUTUM is compatible with the Cepheid® SR buffer and does not need to be removed prior to testing if a centrifuge is not available (see Use Case 3 - Reflex testing: how to run multiple tests from one sample). OMNIgene•SPUTUM-treated samples are compatible with liquid culture, including Becton Dickinson BBL® MGIT®. Samples must be centrifuged according to our recommended protocol in order to remove the reagent prior to inoculating the culture tubes. The reagent is bacteriostatic and will inhibit and/or slow growth in the MGIT tubes if it is inoculated directly. OMNIgene•SPUTUM-treated samples are compatible with solid culture, including Lowenstein-Jensen medium and Ogawa-Kudoh method. Samples must be centrifuged according to our recommended protocol in order to remove the reagent prior to inoculating the culture tubes. The reagent is bacteriostatic and will inhibit and/or slow growth if it is inoculated directly onto the agar. 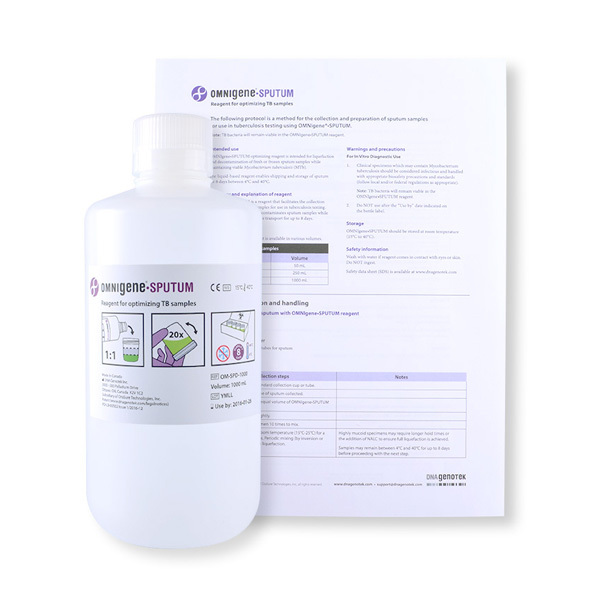 Add OMNIgene•SPUTUM to the sputum sample at approximately 1:1 volume. Secure the cap of the specimen cup or tube tightly; mix the contents by inverting 10x. Swirl a sterile cotton swab in the mixture. Streak the swab on the Ogawa-Kudoh media slant. OMNIgene•SPUTUM-treated samples are compatible with molecular assays, including line probe assays, PCR, targeted and whole genome sequencing. Follow our recommended protocol to prepare sediments and extract DNA using your preferred extraction method. What other sample types can I use with OMNIgene•SPUTUM? Can I use OMNIgene•SPUTUM for Non-Tuberculosis Mycobacteria (NTMs)? Full terms and conditions for all DNA Genotek products are available here. DNA Genotek's sample collection devices and nucleic acid stabilization chemistries are protected by issued and pending patents in numerous countries around the world.